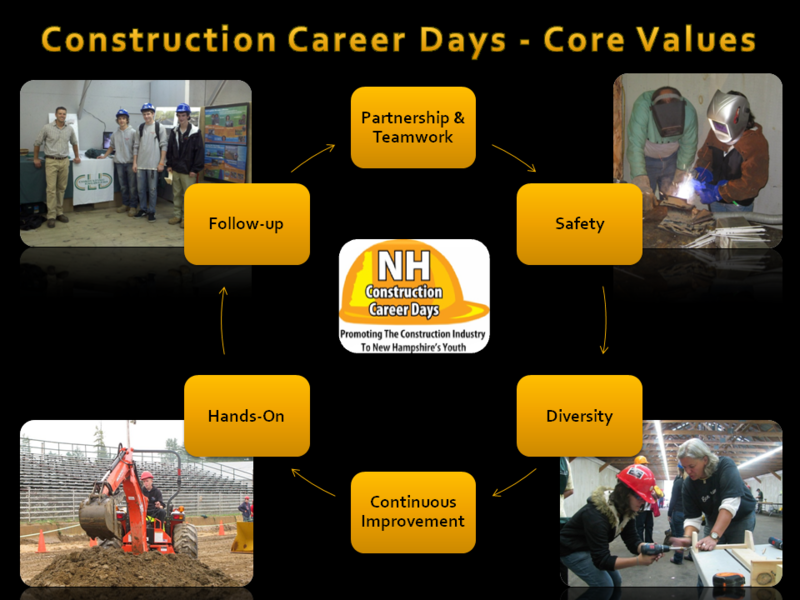 What is New Hampshire Construction Career Days? New Hampshire Construction Career Days (NHCCD) exposes New Hampshire high school students to possible career paths in both the construction and transportation industries through a hands-on exhibits and educational resources. Labor unions, construction companies, school districts, state agencies, trade and professional organizations collaborate to provide the students with an introduction to various aspects of construction. The inaugural 2009 Construction Career Days event attracted nearly 400 students from 22 schools (one-day event). Each year this event has grown and the now two-day event now reaches over 1,000 students annually from over 50 schools. This event increases career awareness in the construction and transportation industries through hands-on experience with heavy equipment, welding, small tools, plumbing, electrical wiring, surveying, waste water management, bridge construction, land clearing, underground utilities, and other construction related jobs. Several secondary educational resources and career training pathways are available for students to learn about. Professionals from a wide array of construction related work are available to speak with students and answer questions about their experiences in the construction industry and why they are so passionate about their career. The day is open to all high school students, both male and female, via registration through a participating school. In fact, one of the goals of this event is to Increase the attendance of women and minorities participating in this event to a target attendance of 25%. Last year we were able to reach out to just over 14% females and 21% minorities. If you are interested in this event please see the "Schools" section for more information. The National Construction Career Days initiative developed by the FHWA has proven highly successful in promoting the transportation industry and the careers it offers to America’s youth. The feedback received from the 34 participating states, is that the events are beneficial to the students and to the industry. The following are the core values that have contributed to the great success and growth of the program across the nation. 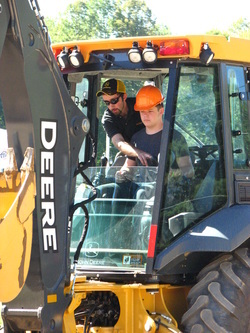 Hands-on- Students are provided and participate in a wide variety of “hands-on”activities, exhibits, demonstrations, including the operation of heavy construction equipment and tools. Activities are designed to demonstrate duties and responsibilities of the various careers in the industry. Safety- A heavy emphasis is placed on safety and security at the site at all times and in all student activities. Safety is reflected in the design and layout of the event site. All involved – students, chaperones, volunteers, exhibitors, operators - are oriented in their responsibilities to ensure the safety of everyone. Diversity- Students that participate include both college and non-college bound since the industry offers careers to both in a variety of fields. The local CCD Planning Team members represent industry, government at all levels, education, industry associations, labor organizations, individual firms, and community organizations. Participating students reflect the ethnic/racial/gender make-up of the schools from which they come. Partnership and Teamwork - Local planning team members work together as equals, set aside personal or self-serving agendas and focus exclusively on promoting the industry to youth by planning and hosting the best event possible. Continuous Improvement - All members of the CCD family strive to improve upon each event and share their best practices with other local planning teams. Follow-up - Local CCD Planning Teams maintain and expand student interest in the industry, generated by their CCD event, in a variety of ways. Strategies could include presentations, mentoring and shadowing programs, equipment and laboratory demonstrations, construction site visits, summer and part-time jobs and other activities. “The rain and gloomy weather didn’t stop nearly 1,000 high school students from all across New Hampshire in attending the third annual NH Construction Career Days event held at the Hopkinton State Fairgrounds. This event promotes awareness of careers in the construction and transportation industries to young adults who will soon fill the gap in vocational, trade and technical jobs left by the retiring Baby-Boomers. Students had a chance to gain hands-on experience at operating heavy equipment, welding, carpentry, plumbing, electrical wiring, surveying and other construction related jobs. There was a variety of additional exhibits including truck driving simulators, distracted driving demonstrations, work the wing on a plow truck, sewer video inspection, personal protection equipment, storm water run-off education, tree climbing and jack hammering. Representatives from several colleges and secondary education opportunities were present to provide educational resources and career training pathways. Students were able to speak with professionals about high school programs, registered apprenticeships, two and four year college curricula and programs run by state and local government. A great deal of collaboration from the labor unions, construction companies, school districts, state agencies and professional organizations was necessary to make this event such a great success. The time and effort these dedicated volunteers contributed was greatly appreciated by all who attended including the students. Being a part of something bigger than what we do on a daily basis can help change the lives of students who once thought a construction career was not for them. These students are capable of great ideas and NH Construction Career Days is a catalyst which gives confidence and support to young adults who are striving for success. "